So yesterday evening, this happened. 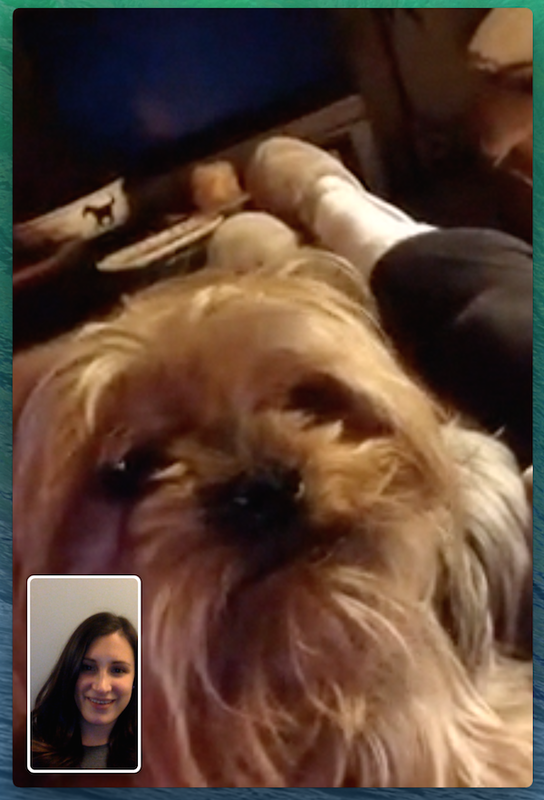 Mischa and I had a little chat via FaceTime. Thanks Mom! As you can tell she's still going for the "messy, I don't own a hairbrush look". For a dog that lives to be told how pretty she is, she sure enjoys looking like a mess in her downtime. From her telling "I'm over this" expression, you can guess that this was towards the end of our call. She had just finished talking to JD, you know, checking up on how his training is going, quizzing him on where the cookies are kept, that sort of thing, and was disappointed that she had to look at me again instead. I don't know what it is about JD, but puppies just love him. About a month ago we were were walking down Hudson and a passing dog went out of it's way to lick his hand. They all gravitate towards him. Anyway, I was starting to cut into her nightly routine of watching some quality television and growling at Paisley for so much as blinking in her direction so we wrapped it up. And on that note, I'm going to go make lunch and socialize with humans.